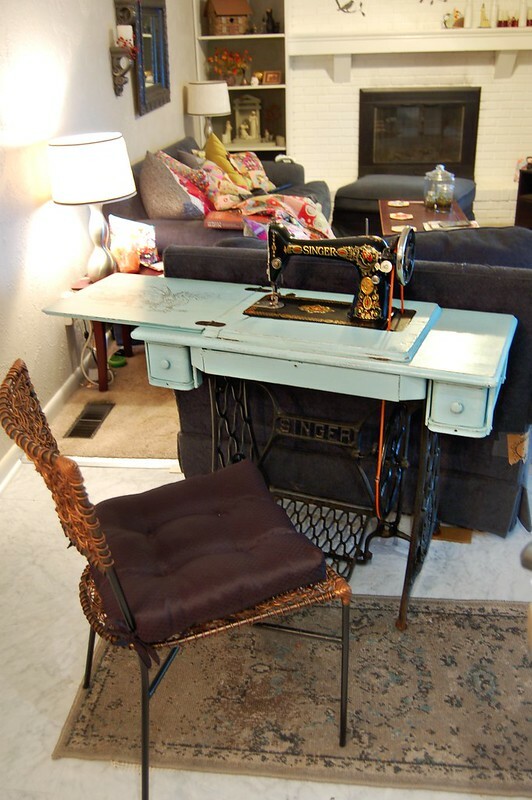 The Singer treadle sewing machine table is finished and I was able to find room for it in our family room/kitchen. Love this placement because I can see it all the time, and I can sew in the very heart of our house. The machine is still a little sluggish, but I’ve been oiling it well and as the oil soaks in, it’s improving. I’ve read that Liquid Wrench is wonderful for “stuck” vintage sewing machines, so I’m going to try that, too. As pretty as it is just sitting there, I do want it to be useable. You can see the Before pictures here. 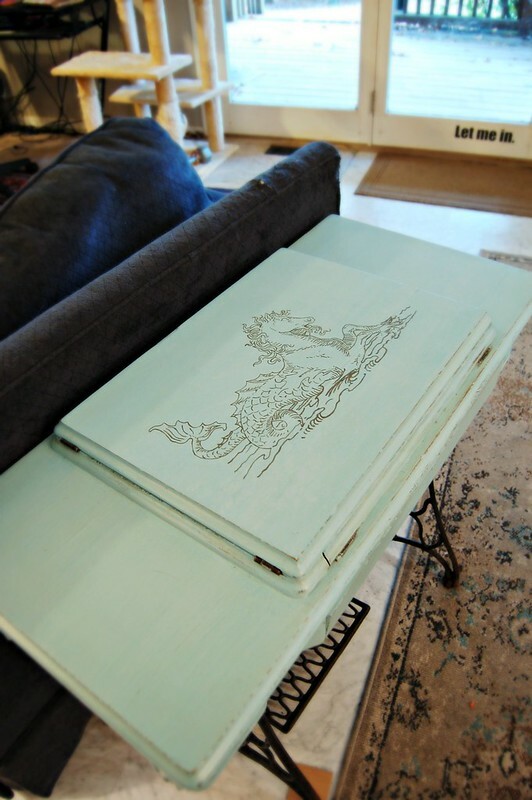 In case you missed it in the previous post, the paint is Miss Mustard Seed’s Milk Paint in the gorgeous aqua color Eulalie’s Sky. The designs were painted in a dark gray from a random leftover tester pot. I didn’t sand much between paint coats to keep the finish a little chunky, and I didn’t fill in imperfections in the wood. 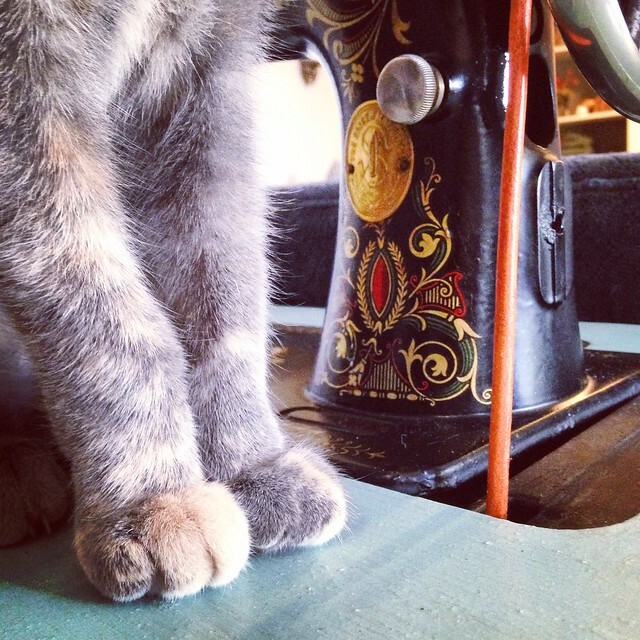 In the picture above with Olive’s paws, you can see the little chalky bits in the milk paint. Really rough areas were smoothed down and the veneer was glued in place where needed, so fabric wouldn’t catch on anything while sewing. After sanding and scuffing the edges a little to enhance the vintage look, I used two coats of the new Tough Coat from Miss Mustard Seed to seal it all. The graphics for the mermaid horse and dragon were found at The Graphics Fairy and are free to use. (If you search the site for the mermaid horse, it’s called a mythical seahorse, if I remember correctly. Beware, once you enter that site you’ll be browsing for hours!) Block Posters resized the images to two pages wide to fit well on the table top. 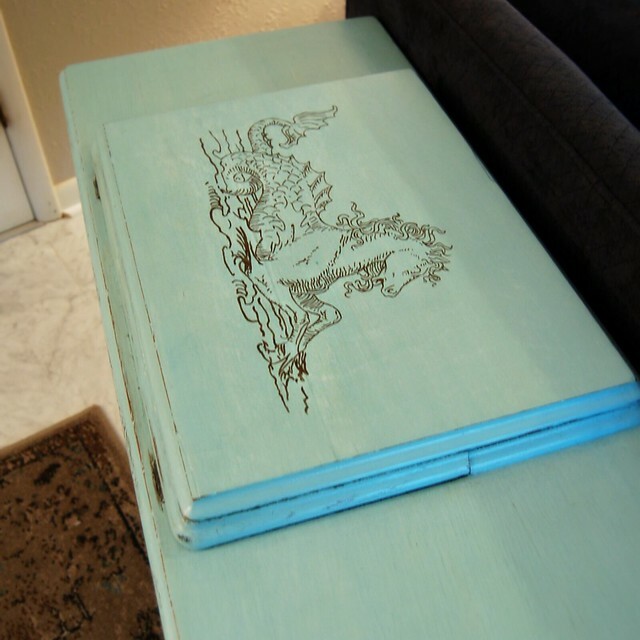 This process was so enjoyable that I think I might need to makeover my nightstand/coffee table/dresser/all the things! 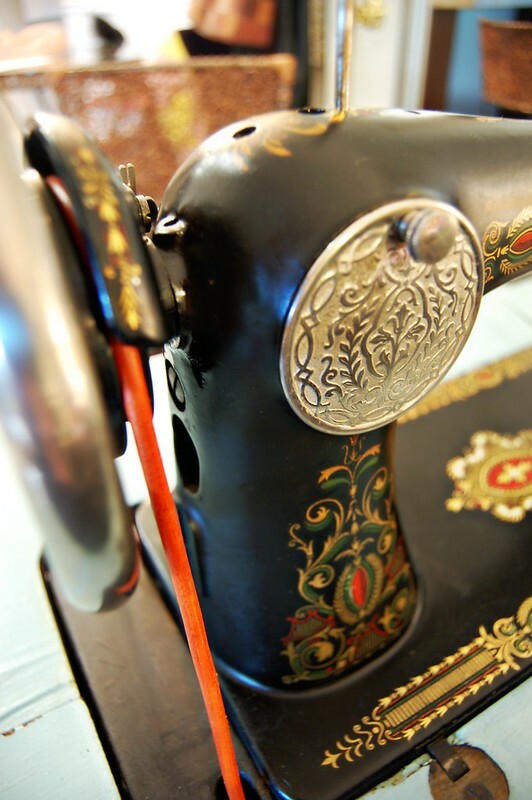 The machine itself needed just two parts, a treadle belt and the little rubber tire on the bobbin winder, which was really showing its age. I found both items at Sew Classic, total cost including surprisingly speedy shipping under $10. With my 1950 Singer Featherweight and now with the treadle, I’ve been surprised how easy it is to find parts. In case you’re interested, the machine is a Singer 66 Red Eye, and it was made in 1911. (I originally read the model number wrong and dated it to 1923. She could totally pass for a 1923!) 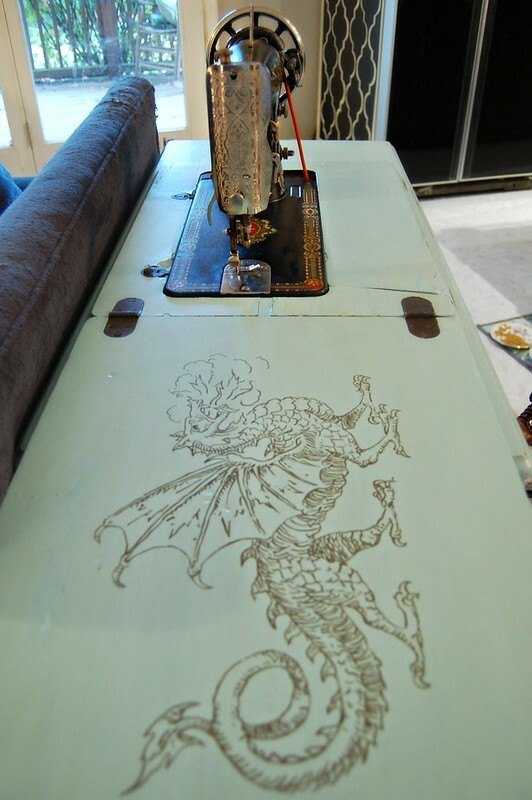 I named her Mildred Nell, after my Grandma who also had a treadle Singer sewing machine. 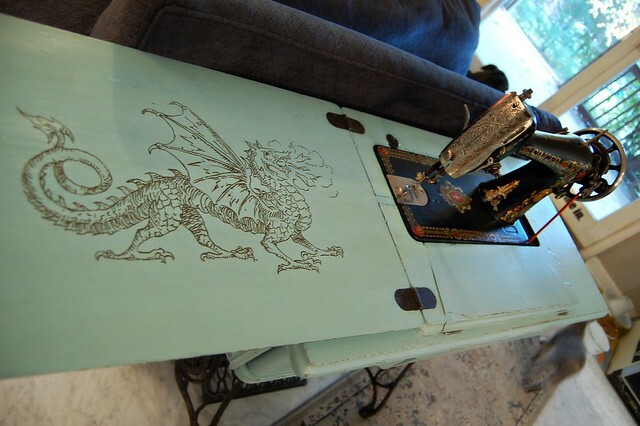 Vintage sewing machines like this are still fairly easy to find through sites like eBay and Etsy, but the tables are a little more rare, and shipping is ridiculous for just a table or a complete set. Local flea markets, garage sales and antique shops are great places to try, too. This machine head alone was shipped for $30, and my friend Lisa at In the Boon Docks sold me the table, complete with another machine. She even gave us fresh eggs from her hens and colorful peppers straight from her garden! Thank you, Lisa, for everything! If you buy them separately, as long as you match the brand of machine and table, they will likely fit. Measuring wouldn’t hurt anything, though. I got much wordier than I expected, so I’ll leave you to it now. Let me know if you have any questions, I’ll try to help!